This is a Tektronix FG501 1 MHz Function Generator. It outputs sine, square, ramp and triangle outputs. There is a variable amplitude from 0 - 15 V p-p. 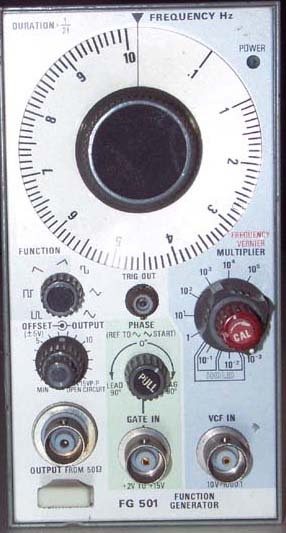 The FG501 Function Generator outputs sine, square, triangular, pulse and ramp waveforms from 0.001 Hz to 1 MHz. It is intended for use in any of the TM-Series power supplies, such as the TM503. Frequency is adjusted by a decade switch for ranges and dial for X1 to X10. Frequency stability is better than 2% (a function of temperature). Frequency can also be controlled, over a 1000:1 range, by applying an external input to the VCF connector. Additional offsets of up to 5 V.
Sinewave distortion is less than 1% and risetime is less than 100 nS on pulses. Triangle and ramp linearity is within 1%. The FG501 Function Generator outputs sine, square, triangular, pulse and ramp waveforms from 0.001 Hz to 1 MHz. It is intended for use in any of the TM-Series power supplies, such as the TM503. Frequency is adjusted by a decade switch for ranges and dial for X1 to X10. Frequency stability is better than 2% (a function of temperature). Frequency can also be controlled, over a 1000:1 range, by applying an external input to the VCF connector. Output amplitudes of 15 Vp-p open circuit and 7.5 V into 50-ohms can be obtained. Additional offsets of up to 5 V are accessible. Sinewave distortion is less than 1% and risetime is less than 100 nS on pulses. Triangle and ramp linearity is within ?%.